This is a site-specific theatrical journey based on the Greek myth about Dedal, Pasiphaya, the Minotaur and Teseus, told in fourteen scenes. For each scene, the company created a unique space, rooms linked together like an anphilade. The audience members follow the performers through each of the rooms, venturing deeper and deeper into the performance. Daedalus is in exile on the island of Crete. He is dreaming up wonderful inventions while at the same time intriguing among the common people, the heroes and the Gods. One of his passions is matchmaking – he is arranging a meeting between Pasiphae and Poseidon, the God of the Sea, whom she had seen in the image of a bull. The offspring of this unholy union is a monster, the like of which heaven nor hell had ever witnessed. In the end, Daedalus creates the labyrinth. The Minotaur meets his half brother Theseus. One of Theseus’s many heroic achievements is the invention of the rules of Greco-Roman combat, a favorite sporting activity of both brothers. Ariadne, the sister of the Minotaur, is calmly watching the games when she first sees Theseus, and is immediately taken aback. At that moment, she gets a glimpse of her own cruel fate. From that instant on, she begins to exist in three separate incarnations, each represented onstage by a different actress. Daedalus is is building the labyrinth on Crete. At the same time, peace negotiations between Crete and Athens have broken down, and the conflict between them is escalating. The Minotaur is imprisoned in the labyrinth. Theseus is preparing to engage in battle, with sword and with flame, to defeat the Cretans and claim the rightful heritage of Athens. Ariadne is by blinded by her feelings for Theseus when she meets him. He seals Ariadne’s lips in order not to hear her revelation. The rain continues to pour down onstage. That night, Ariadne is torn between her feelings and her duty. She cherishes the Minotaur but she loves Theseus. In the end, Ariadne comes to the painful conclusion that she must help Theseus to kill her brother the Minotaur, and then to run away with him. The sun rises into the sky. Theseus and his forces approach the island. Daedalus tells Ariadne the secrets of the Labyrinth. Transformed by this knowledge, Ariadne imparts this information to Theseus, using the image of a Wheel and a Thread. These symbolize his strength and his safe return from the Labyrinth. Theseus’s batallions follow him into the Labyrinth, but the path is so narrow, intricate and long that only Theseus can safely negotiate it. In the centre of the Labyrinth, the Minotaur is waiting with his arms outstretched. The two brothers meet once more. Ariadne is anxious as she waits for events to unfold. While she waits, Daedalus diverts her attention with a puppet show. 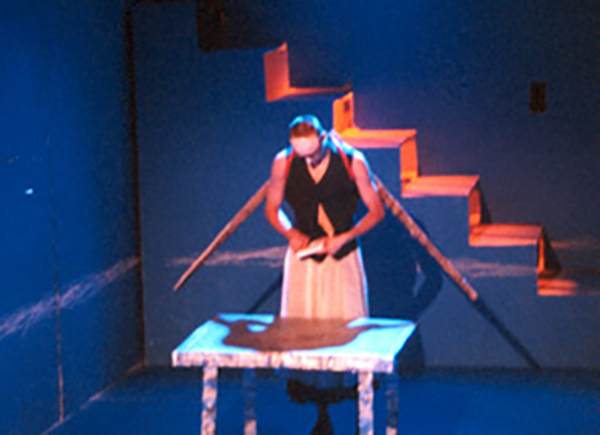 He performs a comedy version of the myth, but Ariadne tries to amend the story in mid-performance. Daedalus appears on stage, dressed as a clown. The brothers meet. The monster dies. The hero is recognized as a hero. That’s about the sum of it. Daedalus scurries across the Red room. He is trying to conceal the part he has played in the death of the Minotaur. He ignores Ariadne, who also doesn’t dare to look him in the eye. In the room, we also find the one-legged Icarus, who is gathering up what is left of the tread. After escaping from Crete, Ariadne and Theseus are living on a deserted island. This island reminds them of another island. They recall another garden where they could forget about all their troubles and woes. While Ariadne is asleep, Theseus steals away. She is dreaming about Theseus. But Theseus is gone forever. Nobody knows for sure how Ariadne went on to spend the rest of her life. There are a few opposing versions. One, known as ‘Ariadne in Mourning’, has her spending the rest of her life in a monastery where she waits for some news from Theseus, but never receives any. Another, known as ‘Ariadne Finds True Happiness’, has her becoming a wife of Dionisis. And in the final account, entitled ‘Ariadne the Dammed’, she is unable to comprehend the death of the Minotaur and the flight of Theseus, and ends up by killing herself.